listening tests, articles, interviews, DIY, etc. The DIY amps on these pages are of SET (single-ended-triode) design, using genuine directly-heated power triodes (unlike some 'triode' amps that used triode-wired pentodes or beam power tubes). SET amps can produce fantastic sound (some say the best sound) using very simple circuits. They produce a mild distortion consisting of primarily even-order (mostly second-order) harmonics that tend to 'fill in' or make the sound a little 'bigger' ; not in a 'special-effects' way, but a very natural sounding way. In musical terms, the second harmonic of a tone (or note) is simply a tone (or note) that's an 'octave up': The 2nd harmonic of A440 (A4) is A880 (A5). A fourth harmonic would be two octaves up. So; these even order (2nd, 4th, 6th etc.) harmonics blend in 'musically'. A sixth harmonic = a musical fifth above the second harmonic. 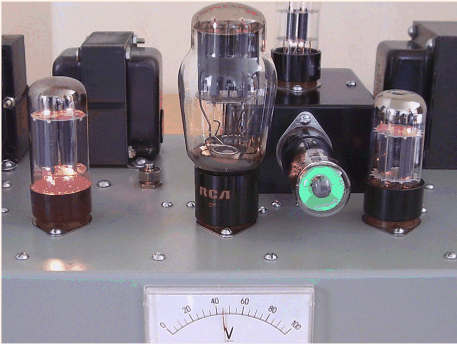 Have a look around & check out the original hand-built tube stereo gear. As time allows, I plan to add much more to this site: prototyping, testing, & construction of the 'Current Project' (211/VT-4C monoblocks), etc. (a phono preamp, a 'plasma tweeter' project, and more). Links to just a couple of my favorite tube suppliers; there's many more 'out there'.